Dr. Babasaheb Ambedkar was an Indian jurist, political leader, philosopher, thinker, anthropologist, historian, orator, prolific writer, economist, scholar, editor, a revolutionary and one of the founding father of independent India. Overcoming numerous social and financial obstacles, Dr. Babasaheb Ambedkar became the principal Architect of India’s democratic constitution and builder of modern India. Dr. Babasaheb Ambedkar was the all time intellectual giant that blessed to the land of India. His contribution to Economics, Political Sciences, Anthropology, Sociology, History, Law, Education and National Security is significant, substantial and spectacular. His potential of visualizing distant future can be portray from his writing and draft of the Constitution of India. His ceaseless fight against untouchability, injustice and inequality led to restoration of civil rights in India. Dr. Ambedkar’s important contribution towards preparing India for democratic self rule and social justice was acknowledged by all national leaders. Being the creator of free India’s Constitution Ambedkar provided constitutional guarantees and protections for a wide range of civil liberties for individual citizens, including freedom of religion, the abolition of untouchability and the outlawing of all forms of discrimination. Dr. Ambedkar argued for extensive economic and social rights for women. He introduced a system of reservations for jobs in the civil services, schools and colleges for members of scheduled castes and scheduled tribes, a system akin to affirmative action. Dr. Bhimrao Ramji Ambedkar is adoringly called ‘Babasaheb’. Babasaheb is the name to be reckoned as an epitome of Cultural Revolution in Social, Political, Religious horizon of pre and post independent India, especially for a significant group of people languishing under inhuman and oppressive Indian society. In this millennium India we should take initiative for awakening the society’s upcoming generation to imbibe the thought put forth by Dr. B.R. Ambedkar, essential for nurturing humanity needed for very survival of mankind. During the last decade of the 19th century, many Indian leaders born among the lower castes like Narayan Guru (1854-1928), Jotiba Phule (1827-1890), and Ramaswamy Naicker 1879-1973) launched massive struggles for the dignity of Dalits throughout India. Ambedkar was the most towering figure among these Dalit leaders. In 1917 he joined the Baroda State Service after returning from his studies in the USA and the United Kingdom, as part of the terms of his scholarship agreement. He worked in the city of Baroda, the place of the ruling family of Gaikwad, which financed his studies abroad. He worked as secretary in the defense office of the Maharaja of Baroda State. However, despite his foreign education, he had to endure insults while at work due to his low caste origin. He was a victim of the cruel dalit discrimination. He suffered the ignominy of having document files hurled by peons at his face. He suffered the humiliating experience of not being served drinking water during official functions. At the officer's club, he had to sit in a corner and keep his distance from the other members belonging to higher castes. He also had difficulties in finding a rented house, as he was not allotted government bungalow. He stayed in an inn owned by Parsis (members of Zoroastrian religion). One morning, as he was getting ready to go to work, a dozen Parsis, allwielding sticks, rushed up to his room screaming that he had polluted the inn and insisted on his immediate departure. He begged them to let him stay for a week longer since he hoped to get his government bungalow by then. But they were obdurate. If they found him at the inn that evening, they said God help him. After spending much of the day in a public garden, Ambedkar, in utter frustration and disgust, left for Bombay by the 9 pm train. These scorching incidents goaded Ambedkar to work for the protection of dalit rights and upliftment of the status of the Dalits. In 1924, he started legal practice in Bombay and founded the Bahishkrit Hitkarni Sabha (Depressed Class Institute) to uplift the Dalits. Henceforth, he started his movement and took the cause of the Dalits. 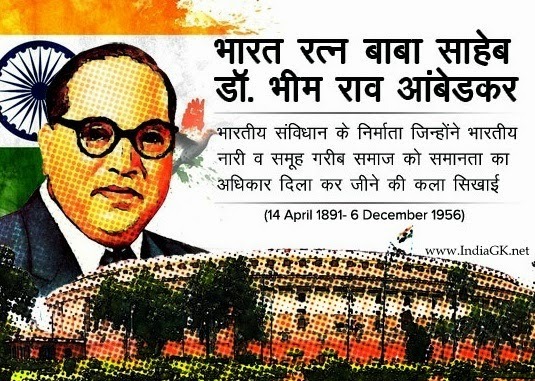 He roused the dalit consciousness to fight for the eradication of dalit discrimination; to claim equality of treatment, status and opportunity; to equally enjoy all rights civil, political, social and economic and respect for the dignity of persons. He was considered a crusader for the human rights of the Dalits in India. Ambedkar was a great supporter of women's liberation. He blamed the verna system, which has not only subjugated Dalits but also women. He questioned Manu Smriti (Laws of Manu), the law book (Dharam-Shastra) of Brahminic Hinduism and attributed to Manu, the legendary first man and lawgiver. Manu Smriti prescribed the Dharma of each Hindu, stating the obligations attached to his or her social class and stage of life. It was hostile to the interest of lower caste people and women. It prohibited re-marriage of widows. He felt that Manu Smriti was solely responsible for the downfall of Hindu women. He encouraged the Dalits to embrace Buddhism to liberate their own selves from Hindu subjugation. Hence he fought for the right to choose ones' faith. After embracing Buddhism, Ambedkar said, "[U]nfortunately for me I was born a Hindu Untouchable... I solemnly assure you I will not die as a Hindu." He practiced what he advocated and became a Buddhist in 1956. He also wrote about the French revolution ideas of fraternity, liberty and equality. He thought that the French and Russian revolutions failed to realize all three ideas. He believed that they could not all be realized except through the way of the Buddha.